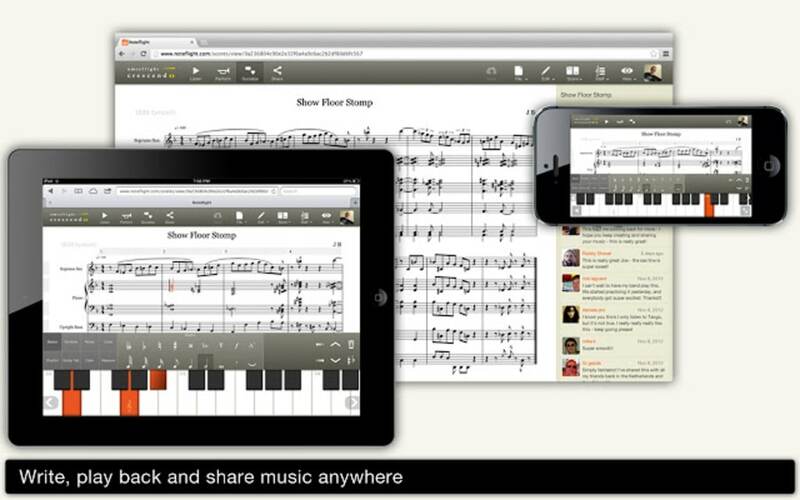 Noteflight is a free musical creation app with social elements. Compose scores using the simple editing tools, save your pieces and find work by others. Noteflight is a stripped back score creation app perfect for on-the-go jotting down. The interface allows for scores to be recorded via a virtual keyboard or by using traditional sheet music. These compositions can then be saved, edited, played back and shared. The service also has a basic social media aspect, allowing users to share their work with others. This work can then be commented on, favourited or ranked. Like-minded individuals can then connect, sharing works and discussing music. The simplicity and ease of use make Noteflight a great way to note simple, single instrument scores, but the lack of advanced editing tools make it difficult and unyielding for longer or larger pieces. While the free version has most of the features necessary, a paid version is available which includes extra space for scores and better editing tools. Noteflight is an interesting combination of musical score software and social media. It is not suitable for serious composition, but fits nicely into a composer's tool box as a kind of informal notebook and discussion forum. What do you think about Noteflight? Do you recommend it? Why?